Beatriz Ascencio hates to cook with corn oil. The Monte Vista Elementary School teacher says it ruins the taste of her refried beans and other dishes. Even worse, it’s loaded with saturated fat that causes bad cholesterol, or LDL, to be stored in the body’s veins and arteries, raising the risk of high blood pressure and obesity. According to Ascencio, she quit using corn oil years ago, opting instead for healthier, but more expensive olive or grapeseed oil. “The others have more saturated fats and many grains are modified genetically,” she explained about her switch. Because her family’s health is important to her, Ascencio says she also makes sure to have fresh fruit available and serves water with dinner instead of sugar-laden soft drinks. “All four of my children, who are now adults, [grew up] eating better foods,” she said. As a result, “We don’t have anyone with arthritis or cardiovascular problems in my family,” Ascencio said proudly. She does admit to sometimes going to McDonald’s on the weekend, but said they only order chicken sandwiches because they suspect the hamburger meat comes from animals injected with growth hormones. But Ascenio is not the norm. For many Latinos, food is a cultural as well as culinary experience. Birthdays, graduations and holidays are celebrated with enchiladas, carnitas, tacos, menudo and other traditional dishes handed down from generation to generation. But many traditional cooking practices are loaded with potential health risks, such as frying tortillas in lard or oil loaded with saturated fat, or preparing beverages like horchata, a rice drink loaded with processed sugar. But healthier and organic foods often have a higher price tag, which can be a deterrent to healthier food choices, as is the cheaper cost and convenience of fast food. Changes in diet and exercise are critical to improving a family’s overall health, but parents who work all day and have little time to cook healthy dishes find it hard to make those changes, according to Lorraine Estradas, chief executive officer of the nonprofit Arroyo Vista Family Health Center, a network of licensed community health clinics in Highland Park, Lincoln Heights and El Sereno. The Arroyo Vista clinic on Figueroa Street in Highland Park sees about 350 patients a day, most for minor ailments and routine exams like mammograms, blood tests, and dental checkups. At times, however, a patient will be too ill for them to be cared for at the clinic and has to be sent by ambulance to the nearest emergency room. Education is key to not getting to that point, Estradas said. “We need to emphasize we have to feel well and be well to continue to be healthy,” she said, referring to Arroyo Vista’s mission to help patients adopt healthy lifestyle changes. An American Diabetes Association study, “The Economic Cost of the Diabetes in the U.S. in 2012,” reported that the rate of diabetes among Latinos is nearly twice as high as it is for non-Hispanic whites in the United States. In 2012, of the 29.1 million people with Type 1 or 2 diabetes, 12.8% were Latinos, while only 7.6% percent were white. The study, released in 2013, also reported that the total cost of diagnosed diabetes had risen from $174 billion in 2007 to $245 billion in 2012, a 41% increase in just 5 years. The cost of treating a person with diabetes is 2.3 percent higher than for an individual without the disease. Between 2009 and 2012, 71% of patients with diabetes seen in an emergency room were also diagnosed with high-blood pressure, or were already taking a blood pressure lowering medication. Estradas, who is also a registered nurse, said Arroyo Vista staff don’t just treat symptoms but are also equipped to explain to patients, in English or Spanish, the causes of disease and how they can phase in lifestyle changes that will make them healthier. “We organize health fairs and hold classes on diabetes, asthma and other chronic diseases,” Estradas explained. “We can help them to improve their health to prevent diseases. We advise adults to have an annual physical, and mammograms for all women. “When a physician develops a treatment plan, it also includes nutrition, exercise and counseling. Our nurses follow up with the patients to find out if they need support with classes and exercises, and with medicine intake,” Estradas explained about the healthcare provider’s holistic approach to care. Anyone can go to the clinic, regardless of immigration status or income, stressed Estradas. For the Huerta family, healthy eating is a matter of survival. The mother of two says she no longer fries food in lard because it’s harmful to the heart. She’s noticed a difference in her family’s fitness since she changed how and what she cooks in response to her husband’s diagnosis. Huerta, 27, serves water at mealtime and has banned her children from drinking soda. When the children realized their father was ill, they didn’t fight the change, which now includes healthier foods like vegetables. Her children seldom ask to go to fast food joint, Huerta added. It’s been two years since her husband was first diagnosed and the man who once drank large amounts of soda now drinks water instead. His health has improved, says Huerta with relief. Abigail Fuentes’ son was also addicted to soda. The 26-year-old construction worker and father was recently diagnosed with diabetes. It was a wake up call that forced Fuentes to quickly change how she cooks, starting with substituting olive oil for the corn oil she usually used. But the olive oil costs more so when money is tight, they don’t always buy it. “We have purchased and used olive oil, and we can taste the difference in flavor. It’s a good oil, but it’s also expensive, and we have put it aside for awhile,” Fuentes told EGP. “But I’ve heard it has many healthier properties and we are going to cook with it again,” she said. Depending on its presentation and country of origin, a liter of olive oil sells in Los Angeles for between $8 and $16, compared to $3 to $4 for the same size bottle of corn or canola oil. Olive oils, marketed as extra virgin, virgin and pure, are considered fruit oils, and don’t turn into bad compounds when exposed to frying or high cooking temperatures. Fuentes, who suffers from arthritis and uses a cane to walk, said these days her family usually drinks bottled water but will still occasionally drink soda. 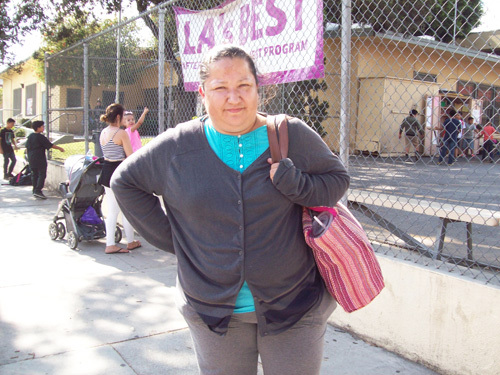 Dr. Martha Rivera works at the Optima Health Care Center in Boyle Heights and says many Latinos ignore ways to stay fit and need education on where to find healthier sources of proteins and other nutrients. Sometimes it comes down to changing how foods are prepared, she said. “They need to eat garbanzos prepared in different ways, smaller portions of tortillas and eat cactuses,” she said as an example. “We need to … teach them the short-term effects versus the long-term effects of fatty oils and good vegetable oils. We need to teach them about the qualities of eating salmon,” she explained. Some meat and poultry are high in saturated fat and can lead to obesity and high blood pressure. Rivera said. The saturated fat can also inflame joints in the knees and hands and lead to diabetes. Soy-based meals provide protein, an important nutrient that keeps healthy muscles, which is mostly found in fish, poultry and meats, Rivera said. She said younger Latino adults tend to develop diabetes because of unhealthy food choices. Compared to traditional fatty oils, olive oil works as anti-inflammatory in veins and joints, and is considered one of the world’s healthiest foods. Health studies have shown switching can help reduce blood pressure, and according to a scientific study titled “Olive oil and cancer risk: an update of epidemiological findings through 2010,” conducted by the Department of Epidemiology of the Institute of Research and Pharmacology Mario Negri in Milan, Italy, olive oil intake was linked to decreased levels of breast, upper digestive and colon cancer when compared to butter and other saturated fats. The American Heart Association reported that high blood pressure, strokes and diabetes are closely linked to obesity among Latino adults age 40 and younger, and that the proportion of adult obese women is larger compared to men. However, because of biological and reproductive reasons, women are better equipped to overcome being overweight and high levels of bad cholesterol. Estradas says Latino parents need to pay attention to the meal their children eat at schools, which are often prepared with low-quality ingredients that make them gain weight. “We don’t see schools providing healthy meals and exercise [to help] the kids develop good health,” Estradas said. “We need to avoid fast foods and eating calories that lead to obesity at an early age,” she stresses. According to Estradas, healthy eating habits need to be developed at a young age, because “Once they grow, the habits stay.